Hey everyone! Happy Valentines Day! Lots of stuff going on behind the scenes these past three weeks. New products, new classes, and preparing for the trip to South Africa with Tim and Mario the first week of March. Can't even tell you how excited I am to travel back to South africa again. This will be my 3rd time to make this journey (and it is a journey - 27 hours to get there!) and I am just as excited to go as I was the first time, back in 2007. Each time has been unique, and I'm sure this time will be no exception. Looking forward to seeing many of the women I have met and stayed in contact with over the years though Facebook. And really, who wouldn't want to go on a trip with Tim and Mario? I know, I'll say it again...lucky, lucky girl. Anyway, my desk has been in a continual state of mess, clean up, mess, clean up. I guess at least I clean up between projects! My husband surprised me with a new work table when I returned from CHA in January and I'm still trying to figure out what would make it the most efficient use of the cubes underneath. A work in progress I think! Also on the home front, golf season has officially started for the high school district so the DH is home late 4 nights a week, which is really cutting into his afternoon napping. Then there is the darn Olympics that are keeping us up way later than usual! Now add in the Westminster Dog show...we are NOT even dog people but for some reason I love watching dogs on TV! Well, I think I've gone on long enough. On to today's Valentine project. Gather a few papers that coordinate - large scale, small scale, dark, light, pattern and text. It all works. Cut the papers into random width strips, no wider than 1 1/2". Cut a piece of scrap cardstock 5 1/2 x 6" (the size of a Bigz die). Adhere the paper strips to the cardstock with a glue stick, repeating some of the patterns. The strips run horizontal across the 5 1/2" width. NOTE: most of the top and bottom will be cut away so I used larger pieces on the ends. I used my sewing machine to add a zig-zag stitch to a few of the the seams. I also added Industrious Sticker Borders and Tissue Tape. A new Bigz die was released this month called the Petal Drop. It might seem like a simple die but I think it has a lot of potential...just watch. The die cuts three petals. When cutting, you will need to make sure the paper you created runs across the petals. This picture shows the paper face up, but when I actually do the cutting, I like to have my paper facing right side down. Here is the result...three perfect petals. And because it's a Bigz steel rule die, there is no problem cutting through all the layers I created. Since it's Valentines Day the theme should be love, so I'm just going to use two petals to create a heart like this. Now I need a surface to put my heart on. I folded a piece of light pink cardstock in half and cut it to 5 x 6 1/2". I used Antique Linen Distress Ink and the Latticework Layering Stencil to create a simple background then sprayed it with Perfect Pearls Mists. Hard to see on camera, but it gives it a subtle shine. I added my heart to the card front and stitched right down the center with a zig zag stitch. Next up, a little embellishment...Another new die, the Mini Prize Ribbon (ships April). 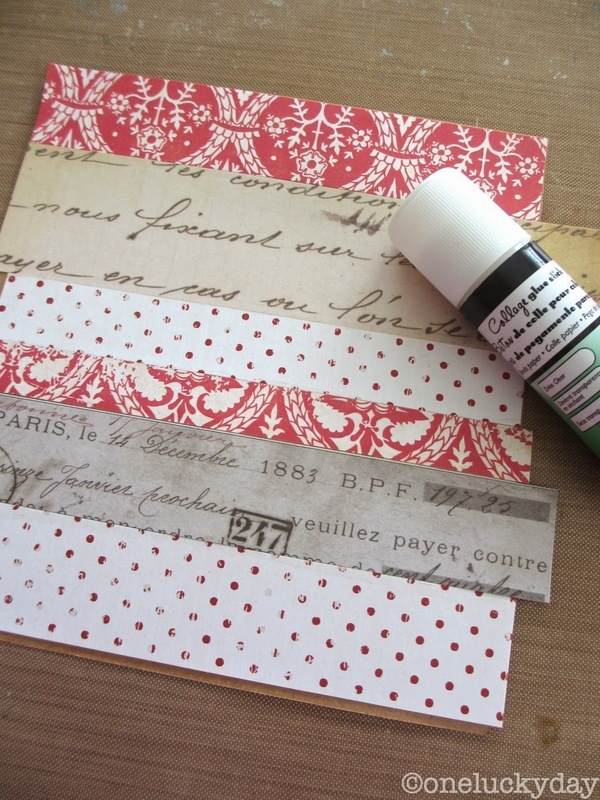 I cut a grungeboard Prize Ribbon then spread a thin layer of Glossy Accents across the top. 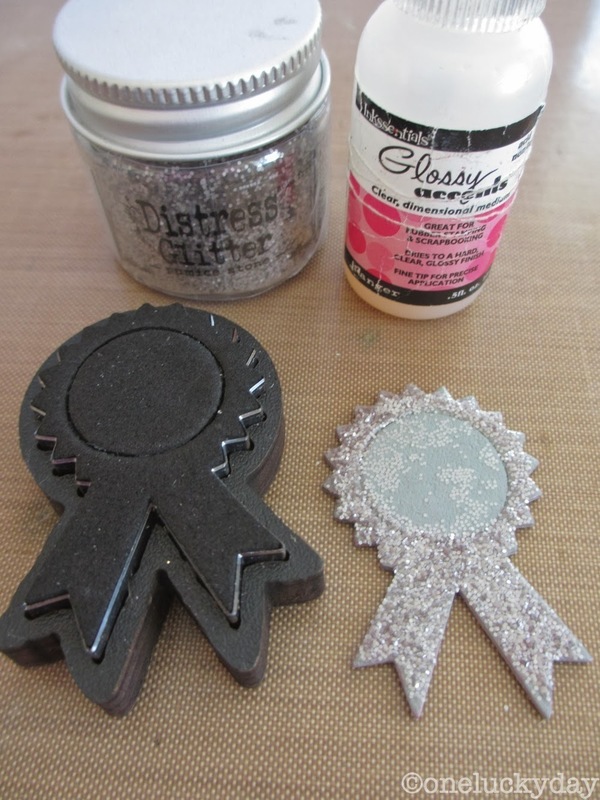 Quickly add Pumice Stone Distress Glitter and leave it to dry. You might notice the center is not glittered. I couldn't decide at the time how I was going to treat it so I did not add the glue/glitter to the center. Here is how it ended up...with a Muse Token sentiment. It would have been better with glitter under the F but that's how it goes sometimes! I added the prize ribbon to the center of the heart with Wonder Tape. Label letters are up next. I like to line the letters up on my finger, then sand and ink the word at one time. Add the word to a red vial label (you know I couldn't have a project without a Vial Label) and a Remnant Rubs sentiment on the side. And there it is...simple, simple, simple but that heart looks like it took hours to create. I thought I might have problems with the thread coming loose on the cut edges, but that never became a problem. I do love the final result...now to get it into a envelope before the DH comes home from work! Love seeing you use your sewing machine. Love using my sewing machine. Love your card. Yes, I love a lot, am a happy crafter. TFS and Happy Valentine's Day Paula!! OMG ... can't find the words ( imagine that me out of words)... Fabtabulously Awesome ??!! You got talent, skills and the whole darn package , Girlfriend ! I love it! Yes, Lucky you ... who wouldn't love traveling with you guys?! thanks Rea'. I'm not sure I have the whole package anymore since I gave up cooking, lol. You are definitely on lucky, lucky girl! Enjoy your trip with the boys! Okay - love the use of the petal die and the trick on how you sand your letter stickers - brilliant!!! You must have the most industrial sewing machine ever to go through all that! This is absolutely FABULOUS and LOVEly!!!!! Lovely. You never cease to amaze. Hope you have a wonderful trip. Hope to see you in Texas soon. Wonderful, love that heart!! Oh and I so like the idea of sanding the little letter labels, never thought of that.... great card altogether and I am sure DH will just love it!! thanks Astrid! Simple is good in my book! Fabulous! Oh rats, knew when I saw these two dies in action I would want to add them to my wish list. Great tips. Lucky girl to get to travel for work! Happy valentines day. This is darling, what a great die! Simply enchanting! Hope you have a fabulous trip... safe travelling! Quick & easy - my kind of card! Very classy! I am completely in love with this piece! it is simple, clever, wonderful and teaches how to use the material in a very creative way! you are fabulous! 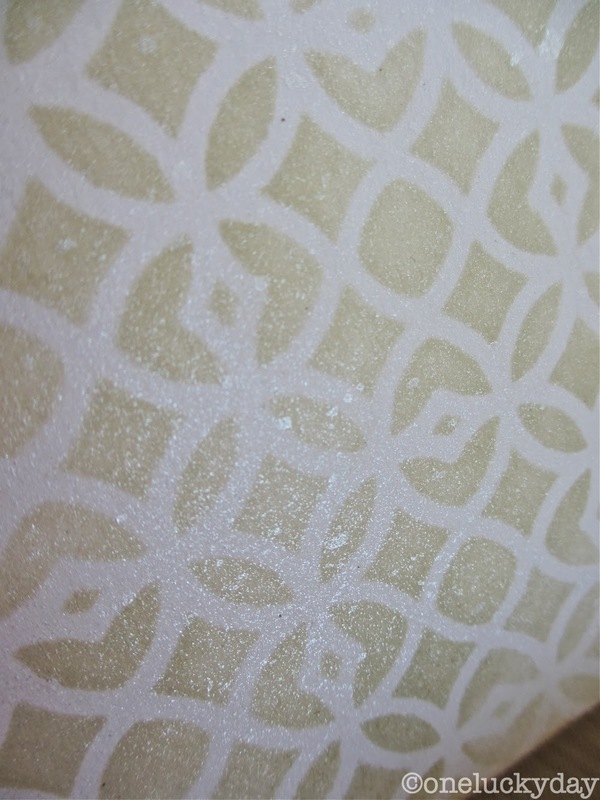 I am in LOVE with the lattice stencil. Probably my most favoritest (!) of Tim's latest release. Love your heart card and I bet hubs did too! Beautiful ... guess I really do need those industrial strips! I'm enjoying it also for not being so dimensional, a nice thing when mailing. That is a great project. It looks very beautiful. Thanks for sharing. Your ideas are just... The best!